Located in the picturesque country town of Lancefield, Victoria, only an hours drive from Melbourne, this 4 bedroom cottage and studio, is the ideal place for a getaway. Our aim is for Sewjourn to be a place to relax, create and enjoy for Quilter’s Retreats, Scrapbooking Weekends, Book Clubs, Craft Getaways, Girl’s Weekends or Women’s Retreats. Accomodating up to 10 people and a two minute walk to shops and facilities, Sewjourn is complimented by a large, light-filled craft studio designed to encourage creativity. We believe our name, Sewjourn, a twist on the French word sojourn which means ‘to rest and stay’ says just what our guests can expect. 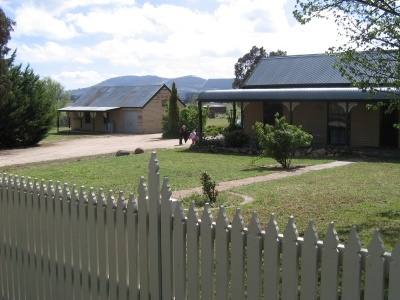 The newly renovated property opened in August 2008 and bookings are now being taken. For information on pricing and availability please refer to the Bookings section of our website. You can also visit our blog which contains snippets of our renovations and crafty projects. If you have any questions or comments, we would love to hear them, so please either submit your comments on the blog or use our contact form.